Circuit uses OAuth 2.0 for authentication and authorization and supports most common OAuth 2.0 scenarios such as Bots, server and client-side Web Apps. Mobile client SDKs are in the works, but in the meantime can use the REST API with an open source OAuth library. This page is intended to provide an overview of the different OAuth types and help you in choosing the right type for your app. A complete Developer Portal with tutorials, examples and documentation is coming soon. The client_id and client_secret in the examples shown on this page are invalid. You need to request your own app to get a client_id and optionally client_secret for your domain. Which OAuth 2.0 grant type do I need? Read the descriptions in the OAuth 2.0 Grant Types section for more information on the 3 different grant types supported by Circuit. 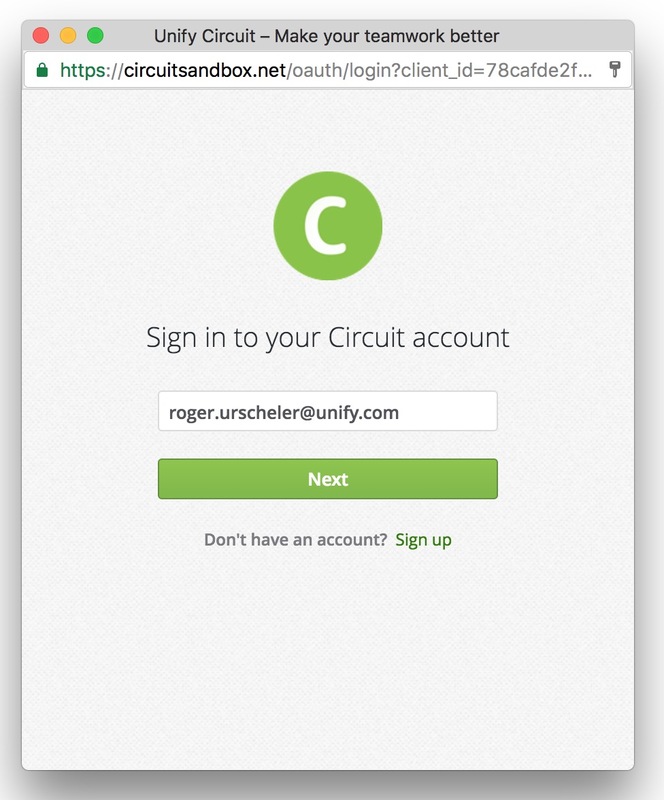 Tenant admninistrator can now create OAuth apps on the Circuit webclient. See Getting Started page for details. The authorization code grant type is optimized for server-side applications, where source code is not publicly exposed, and Client Secret confidentiality can be maintained. This is a redirection-based flow, which means that the application must be capable of interacting with the user's web browser to open the Circuit OAuth authorization page. Rather than implementing the OAuth flow manually as shown in this example, it is recommended to use an OAuth library. There are many open source libraries available on github and npm such as oauth, simple-oauth2 or passport-oauth2. For more details on Authorization Code Grant refer to rfc6749 section 4.1. Once your app is registered you are provided with a client_id and client_secret. The client_id identifies your app. The client_secret is like a password, so keep it confidential. Using these credentials your app can get an OAuth access token on behalf of a user, as long as the user grants your app access. On page load, or on a user action (e.g. login button) your app needs to redirect the browser to Circuit's /oauth/authorize endpoint. Rather than a redirect, apps usually open a new window instead as seen in the images of Step 2.
response_type code Causes the Circuit endpoint to return an authorization code. Web server apps should use code. client_id The client_id obtained when requesting the OAuth app. Identifies the client that is making the request. The value passed in this parameter must exactly match the client_id obtained. redirect_uri Url to be redirected after access is granted by user. Complete Url including protocol and port if applicable. Host (protocol, domain and port) must match one of the domains of requested OAuth app. E.g. https://my-cool-app.com/oauthcallback in which case https://my-cool-app.com had to be requested on app creation. state Any string Provides any state that might be useful to your application upon receipt of the response. The Circuit Server roundtrips this parameter, so your application receives the same value it sent. To mitigate against cross-site request forgery (CSRF), it is strongly recommended to include an anti-forgery token in the state, and confirm it in the response. This parameter is not required but strongly recommended for above mentioned security reasons. 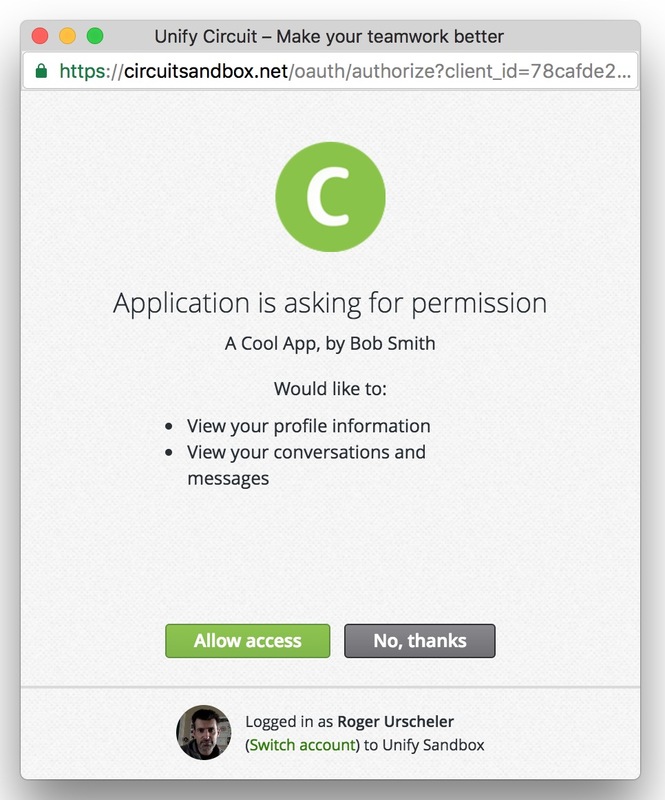 The browser will now show the OAuth permission/consent page (with prior login if not already logged in). This page is asking the user to give your app permissions to act on the user's behalf. The app name and author are shown on that page to identify the app, as well as the requested permissions. Once the user grants access, the permission page is redirected to the redirect_uri with the code and state as url parameters. Your application should verify that the state parameter matches the request to prevent CSRF attacks. The code will be used in the next step to request an access token. Note: If the consent page was opened in a new window your application is responsible to close it and pass the parameters to the parent window (your app). The code received in the previous step is short lived (60 sec). The application needs to exchange this code with an access token in that timeframe. code The authorization code returned from the previous step. client_id The client_id obtained when requesting the OAuth app. client_secret The client_secret obtained when requesting the OAuth app. redirect_uri One of the domains registered requesting the OAuth app, or simply the same redirect_uri used in the /oauth/authorize request. If the authorization is valid, the Circuit Server will send a response containing the access token (and optionally, a refresh token) to the application. With the obtained token the application can perform REST API calls, or use the JS SDK in node.js or even in the browser. But if you app is a client-side web app, you are much better of to use the JS SDK to handle all the above, and use the implicit grant explained below. For REST API calls, the OAuth access token (aka Bearer token) should be included in the HTTP Authorization header. curl -i "https://circuitsandbox.net/rest/v2/conversations" -H "Authorization: Bearer a542f71d785d40b9924c8d07b518629a"
Simple server-side web app in node.js is listed on the REST API page with its source code on github. Server-side node.js web app using simple-oauth2 to handle OAuth flow on github. This app also uses the JS SDK to update text messages. For more details on Implicit Grant refer to rfc6749 section 4.2. Once your app is registered you are provided with a client_id. The client_id identifies your app. Using the client_id your app can get an OAuth access token on behalf of a user, as long as the user is willing to give your app access. response_type token Causes the Circuit endpoint to return an access token. Client-side web apps should use token. state Any string Provides any state that might be useful to your application upon receipt of the response. The Circuit Server roundtrips this parameter, so your application receives the same value it sent. To mitigate against cross-site request forgery (CSRF), it is strongly recommended to include an anti-forgery token in the state, and confirm it in the response. Once the user grants access, the permission page is redirected to the redirect_uri with the access_token and state as url parameters. Your application should verify that the state parameter matches the request to prevent CSRF attacks. The access_token can now be used by your client-side app to perform API calls on the user's behalf. With the obtained token the application can perform REST API calls, or even use the JS SDK using the token. But if you are using the JS SDK then you can skip all the above steps and let the SDK do that work for you. A simple client-side web app OAuth example is listed on the REST API page with its source code on github. The client credentials grant type provides an application a way to access its own service account. Examples of when this might be useful include Bot applications that can be added as participant in conversations. For more details on Client Credentials Grant refer to rfc6749 section 4.4. Since this flow is acting on its own behalf rather than on another user's behalf, this flow is very simple. The application requests an access token by sending its credentials (client_id and client_secret) to the Circuit server. grant_type client_credentials Causes the Circuit endpoint to return an access token for the client_id and client_secret. client_id The client_id obtained when requesting the OAuth app. Identifies the client that is making the request. The value passed in this parameter must exactly match the client_id obtained. Sent in body, or in Authorization Header. client_secret The client_secret obtained when requesting the OAuth app. Secret to authenticate and authorize the app. With the obtained token the application can perform API calls. After an access token expires, using it to make a request from the API will result in an "Invalid Token Error". At this point, if a refresh token was included when the original access token was issued, it can be used to request a fresh access token from the authorization server. This is only applicable to the Authorization Code Grant. Use REST API. Not available in JS SDK. For more details on Token Refresh refer to rfc6749 section 6. The JS SDK allows apps to renew the access token prior to its expiry using the API renewToken. This is applicable to Implicit and Client Credentials Grant. For Client Credentials grant the token can also be automatically renewed by setting the configuration parameter autoRenewToken. Users can revoke tokens created on their behalf on their Circuit web client at "Settings > Security > Connected Apps". Applications can revoke token using the JS SDK API revokeToken.